Note: These models have readed end-of-life. New models have replaced the 2156 model, notably the CL1314 and CL2300 devices. The Patton 2156 devices extend Ethernet to distances approaching 32,000 ft. (9,754 m). They have a maximum speed of 2.3 Mbps using existing twisted pair of copper. 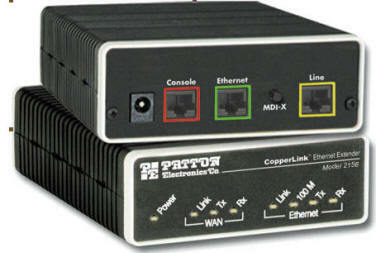 As with all of Patton’s Ethernet Extenders, they are Plug-and-play with no configuration necessary. Made in the USA — This Patton equipment is designed by Patton engineers in our Gaithersburg, Maryland . Patton’s American-made manufacturing process delivers high-quality networking solutions with reliability you can trust. When you have a remote location that needs connection to your LAN, think about the Patton model 2156 LAN extender. With a simple set of plug-and-play extenders, you can make that connection easily using the existing twisted-pair copper infrastructure already installed worldwide. The ability of the unit to operate transparently with higher level protocols, like VLAN tagging, enables the 2156 to fit into almost any location where cost-effective LAN extension is needed. The 2156 also provides users with easy-to-read LEDs that enable them to verify that everything is working properly. If there ever is a problem, the built-in test switch helps users quickly figure out which side of the extension is causing the problem. The 2156 installs quickly—there is no configuration needed. All these features—and the fact they make the most out of the existing copper infrastructure—make the 2156 LAN extenders the best choice for long distance Ethernet extension!